Below you will find details of what we currently have available for sale - both livestock and produce. To order from us, please contact us so that we can discuss your requirements. Aged black and white rams. We will be clipping shortly and are taking orders for fleece. Please mail us to place an order for this years clip. Last year demand outstripped supply so we cannot guarantee to fill any large orders completely but will do our best to allocate fairly, priority being given to regular customers. We shear in June but it takes some time to prepare the fleeces for sale. We generally sell fleece at Woolfest in Cockermouth at the end of June but unfortunately I forgot to fill in the entry form so we won't be there this year again!. We have both raw and washed fleece and a small quantity dyed for handicraft purposes but we don’t sell spun wool. If you wish to order any item which we would normally be selling at Woolfest please mail us. Any orders for this years clip will not be processed until the fleece is sorted. This generally takes until the middle of July. When ordering it would help if you let us know what you were planning to use the fleece for and the staple length you require - some locks are very tighly crimped and others are more open and easier for spinners whilst felters often look for long, crimped locks. Occasionally we sell separated locks in small quantities raw or washed to order. All shearling ewe fleeces are washed on the sheep with cold water. 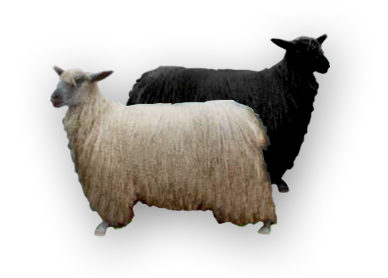 All other fleeces have had daggings, dirty skirting, matted and crayon marked wool removed. It is generally pretty clean though some ram fleece will need a good wash.
All fleece is bagged in polythene bags, and labelled with weight, staple length, cost and comment on the type of fleece. We sell raw wool by the whole fleece. It is priced per kilo by the quality of the wool. Weights are between 2.5 and 5 kg. An average ewe fleece costs £16/kg roughly £40 - £60 (staple length 5” - 10”) . Second and third clip have a staple of 6" - 9"
We wash a few fleeces by hand and sell them in small quantities. NOTE that the price per kilo for raw fleece is for the whole fleece. If you require smaller quantities please add 15% to the price per kilo. Washed fleece is priced by weight. These are from the ram lambs which are killed for meat. We salt the skins and then send them to Mary Macalister for tanning at her tannery at Torrisdale Castle, Carradale, Argyll. She processes them by hand, organically, the wool has a long silky staple and the skins are bigger than a normal sheepskin. Prices start at £150.